Please add it to your bookmarks and stay tuned for upcoming news about "Ascend" my latest piece. Its been quite a while since we installed Gas Town Buskers at the BC Children’s Hospital Acute Care Center in Vancouver. I am always playing catch up, there seems to be no end to it; which is a good thing. In October 2016 the BC Children’s Hospital Foundation commissioned me to build a sculpture for the new Acute Care Center, which was still under construction. The sculpture was to be situated on the sixth-floor outdoor patio. I was (and am) very honored to be chosen for this project. Over the course of that summer I built the piece and installed it in September. A few weeks ago we were very fortunate to be contacted by a producer from OhMore Media. He asked if I would be interested in taking part in a documentary featuring my sculptures. The main interest was to be my process. Why not?! Director Ken Barnes enters the story ... And he brought his incredible talent with him. Ken recognized and captured the joy in my work. Here it is: 'The Gift of Joy'…. getting ready for something new…. Recently I was contacted by the DuPage Children’s Museum to create a water sculpture for their facility. The museum is just what you would expect: A place for kids to have fun while discovering new things, and experiencing how those things work. Filled with colour and super-fun looking mechanical and scientific installations, the DuPage Children’s Museum must be a dream place for kids of all ages to visit and hang out. A few weeks ago we completed installing a sculpture at Maplewood Farm in North Vancouver, BC. The sculpture was commissioned by the North Vancouver Regional District Arts Commission earlier this year and was intended to be a functional part of the farm’s rainwater collection system. Positioned between the barn eavestrough downspout and the rain barrel, the sculpture acts as a interceptor. Water Factory is a rainwater driven kinetic sculpture that embodies form and function; and was inspired by a big red barn wall. 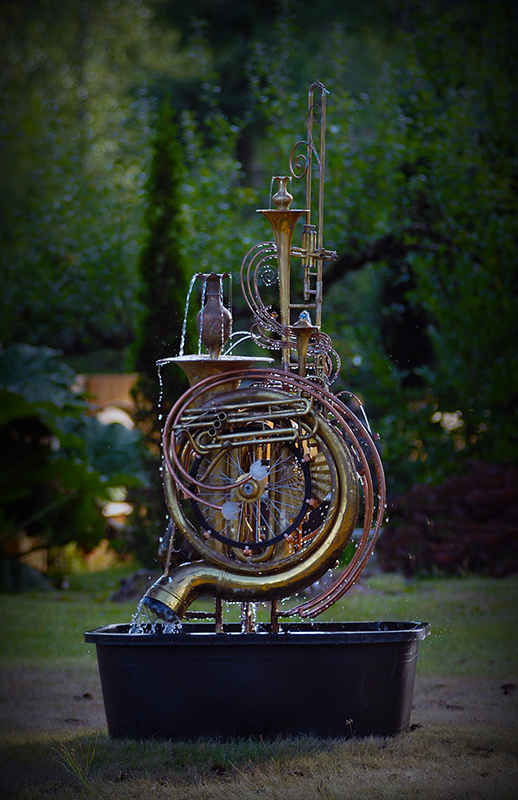 Here are some photos of my most recent musical instrument fountain. I enjoy building sculptures that share the same basic theme, and the French Horn Union is one of those. I think this is number nine or ten in the French Horn Union series. I'm calling this piece "The French Horn Connection" Each sculpture in the series shares the common factor of a pair of french horns setup in an "S" shaped pattern, but that's the end of any similarity. I couldn't duplicate a fountain sculpture if I tried. the cat lady is completed - a sculpture made from recycled metals is revealed. I am so very excited to have finished this sculpture; "Obsession" As many of you know, I mainly build water feature sculptures from up-cycled, discarded musical instruments and found objects, but once in awhile I get to stray from the usual and tread in unfamiliar places. The idea for the Cat Lady sculpture was inspired by one of my long time clients. She wanted me to build a significant piece as a gift for her employer. He, "the employer", is just crazy about cats; in fact he is the founder of a well known cat rescue organization. This is part of an ongoing series, we are doing to feature all the amazing Master Upcyclers out there. Have someone we should consider writing about, then please Email Us! Follow the Master Upcycler Series here. Whimsical, eclectic, and humorous, award winning Canadian artist Douglas Walker blends and forms ordinary objects into finely crafted garden sculptures. new photos for my gallery. a new musical instrument fountain is completed. Tuba Tango Was completed a week or so ago. I love the swirling composition of this fountain. The sousaphone set that up. Just as soon as I attached it the sculpture took shape. 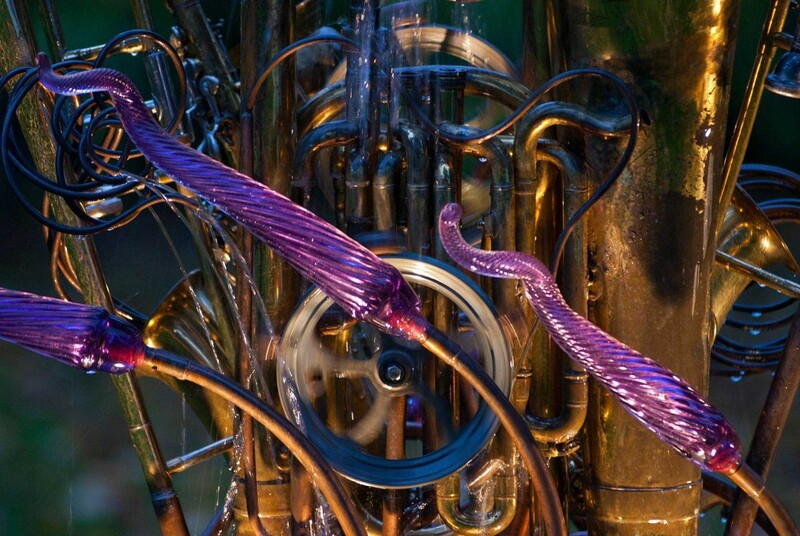 recycled horns make music again as waterworks fountains by artist douglas walker. When I am developing a room design, there is usually a simple idea or theme that sparks my imagination and starts the process. 76 trombones a musical instrument sculpture. Here is a great photo of the sculpture 76 Trombones on location in Mason City Iowa as part of River City Sculptures on Parade. I met a new friend (Rick Underwood) last weekend at the Moss Street Paint In, in Victoria BC. He had recently been to Nelson BC where he happened upon my sculpture; 76 Trombones. He did a wonderful job of capturing the spirit of 76 Trombones and the results are below. Thanks Rick! The City of Nelson has leased this musical instrument sculpture for the next year from the Castlegar Sculpturewalk lease program. This Short video shows you what our musical, metal art Garden fountains look like when they are running! Please share with your friends, every "like" "share" and comment helps! This short video was made by my friend Ross Bodenmann. Featuring me in my shop working on a outdoor sculpture made of used musical instruments and various pieces of scrap metal. Hope you enjoy! 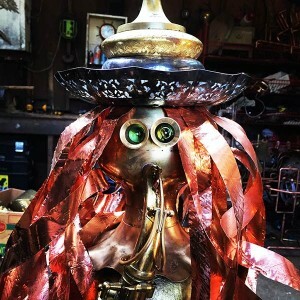 Douglas Walker is known for creating unique water features and garden art sculptures using, among other things, discarded musical instruments, recycled copper, silver, brass and glass collectibles. His sculptures are best described as whimsical, eclectic, humorous and certainly one-of-a-kind. A master recycler, Douglas blends and forms ordinary objects into finely crafted garden sculptures. the following is a collection of Human form sculpture Doug has created.